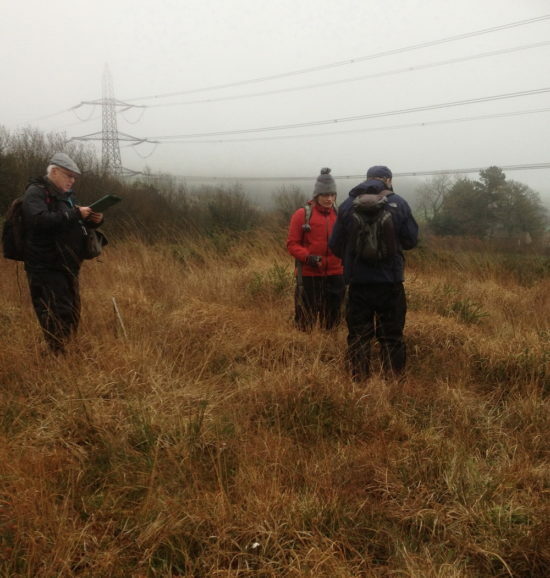 6th December 2015 – Lambert’s Castle and Fishponds. On a grey misty day, a small party of Sharon Pilkington and Jenny Bennett joined Andrew Branson to record mosses and liverworts with John Newbould doing the paperwork. During the day we made 105 records of 70 species. In the morning session, we surveyed the perimeter of the hill fort. Lambert’s Castle has a beech plantation on the north and east slopes probably planted around the time of the First World War. Many of the branches and trunks of the beeches were covered with the moss Hypnum andoi. Cryphaea heteromalla was seen on bark along with liverworts such as Cololejeunea minutissima, Frullania dilatata, Microlejeunea ulcina and Metzgeria furcata and M. consanguinea. Dicranella heteromalla was found on woody banks with Lepidozia reptans and Pseudotaxiphyllum elegans. The epiphytes Orthotrichum pulchellum and O. lyellii were found on the southern margin of the hilltop enclosure. The grassland at Lambert’s Castle is one of the few places in Dorset where mat-grass Nardus stricta is found together with the acid grassland mosses such as Rhytiadelphus squarrosus, Walking along the exposed, short grassland along the southern ridge in square SY3798, Polytrichum juniperinum, P. piliferum and an invasive alien species Lopholocolea semiteres were pointed out. This last species from the southern hemisphere was first seen on the Scilly Islands in 1955, and has been spreading across southern and eastern Britain in recent years. Part of the group at Fishponds. After lunch, we moved to Fishpond Bottom, located on the hill slopes to the south of the hill fort. In particular, we were keen to visit three fields of purple moor-grass Molinia caerulea mire north-west of the Church. The first moss of interest Sharon pointed out was Bartramia pomiformis on a hedge bank just inside the gate. 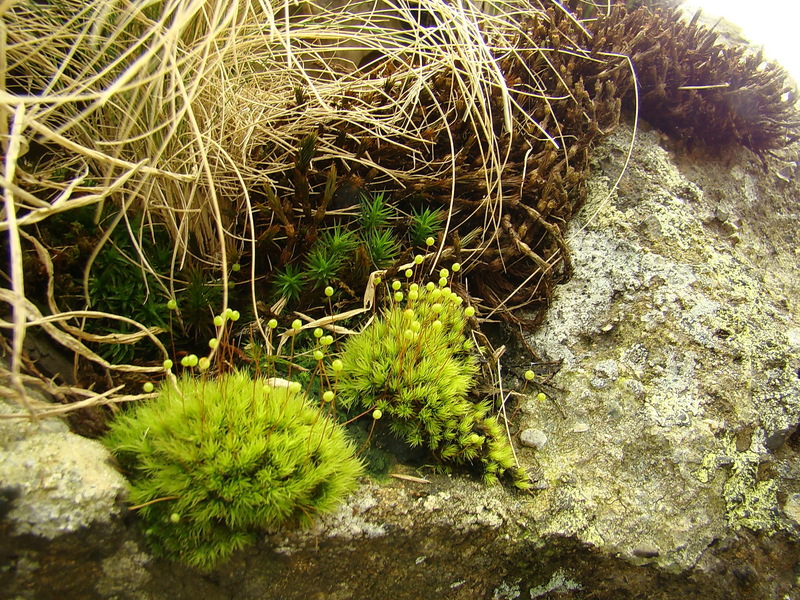 This attractive moss has a decidedly western distribution and appears to have declined from many of its former localties in southern England and is rare in Dorset. The mosses and liverworts recorded here are amongst quite dense purple moor-grass with an interesting mix of vascular plants including: marsh violet Viola palustris whose Dorset stronghold is on the acid wetlands of west Dorset in 10km squares SY39 and ST09; pale butterwort Pinguicula lusitanica whose Dorset stronghold conversely is Purbeck, and marsh pennywort Hydrocotyle vulgaris. Other higher plants included devil’s-bit scabious Succisa pratensis, bog asphodel Narthecium ossifragrum. bog pimpernel Anagalis tenella, bog pondweed Potamogeton polygonifolius in wet flushes, sharp-flowered rush Juncus acutiflorus and common cotton-grass Eriophorum angustifolium. Hedges consisted mainly of willows but also holly and silver birch, with hard fern Blechnum spicant frequent on the hedge banks. These hedges are important for epiphytes – both as lichens and bryophytes with Neckera pumila, Zygodon conoideus and liverworts Cololejeunea minutissima and Frullania dilatata amongst the species present. Hookeria lucens, a moss of wet flushes on wood banks and streamsides was present along the northern hedgerow. Amongst the purple-moor- grass five species of Sphagnum were recorded: S. capillifolium subsp. rubellum, S. inundatum, S. palustre, S. papillosum and S. subnitens, with the moss Warnstorfia exannulata found amongst the sphagnum. Three species of liverwort were seen with the Sphagnum including: Kurzia pauciflora, Calopogeia fissa and Cephalozia connivens. Aneura pinguis and Calopogeia arguta were also present. Finally, we visited the small churchyard (SY36889833) where we recorded ten species including: Barbula convoluta, Dialytricia mucronata and Didymodon insulanus. Sharon and Andrew were concerned at the lack of grazing on the mire with purple moor-grass tussocks starting to shade out the more demanding mire species. Tussocks reached 750mm in one field and were somewhat smaller in the first field at about 400mm. Light grazing with cattle would greatly benefit the first field, whereas the second field with the larger tussocks it may be better to have a burn. Although it was agreed that this might be difficult given the enclosed nature of the site and the nearby houses. The leaders also recommended a more detailed survey on this important West Dorset site.